Topic: How to download builds from Buildbot? Thank you very much criezy! How to download builds from Buildbot? I see! Thank you for your answer Raziel! 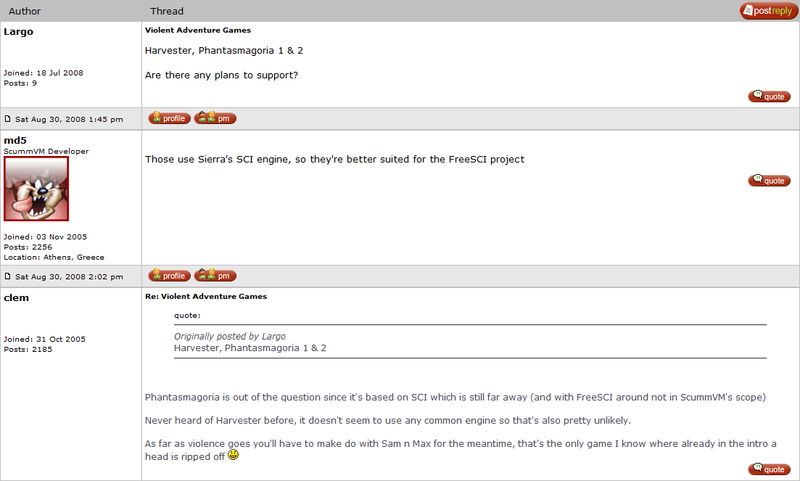 Hey guys, just wondering how likely it is for ScummVM to support Harvester in the future since back in the day people would say Phantasmagoria 1 & 2 were not going to be a thing, and here we are many years later with version 2.0 supporting both of them. Now that Phantasmagoria 1 & 2 are a possibility I'd like to see Harvester as well, such an amazing hidden gem and I would do anything to be able to play it on my phone, hell even on PC because it's still a pain trying to run it through DOS. Quick question, is there any way to swap mouse buttons? (For example, "Single tap" for right click and "hold finger + tap" for left click). I can't replicate the issue on iphone-clang-iphone-retina-input-19a2a2fd because the mouse won't work (it doesn't move), neither I can activate click-and-drag mode. It would seem the touch function is disabled as soon as I open the app.